Works in most barefoot and minimalist shoes. Strategically placed cushioning provides more padding for the crucial heel area. Channels molded into the shape of the arch help move warm air out and draw cooler air into footwear. 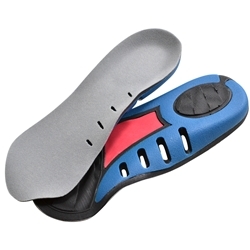 The antimicrobial in the top cover helps keep the insole top odor free.